Syracuse Animal Rights Organization and People for Animal Rights of CNY are hosting Michael Budkie, Executive Director of SAEN – Stop Animal Exploitation Now, who will be presenting the current state of animal experimentation in the United States. 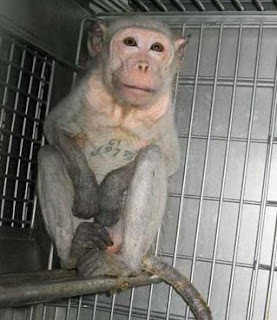 There will be information about laboratories here in Syracuse, as well as recently leaked photos from Primate Products, a major vivisection supplier in Florida. This event is free and open to the public. Budkie’s recent book, “Tear at the Jacket”, blows the lab doors wide open by revealing the horrors of the daily lives of primates in laboratories across the United States. Copies of this book and SAEN t-shirts will be available for purchase at the event for $15 each (cash or check only). When: Thursday, September 30th from 7pm-8:30pm Co-sponsored by Syracuse Animal Rights Organization (SARO) and People for Animal Rights. Contact 546-5108 or 488-PURR. This entry was posted in Uncategorized on September 6, 2010 by saro.